During Ubisoft’s E3 Press Conference, the publisher released a trailer for the upcoming Survival DLC for The Division. Additionally, Ubisoft provided some more details on the game’s first expansion, ‘Underground’. As reported earlier, the Underground DLC for The Division will release on June 28 for Xbox One, and PC. The game’s first expansion will be available on PS4 on August 2nd. The new content will also be available on PS4 on August 2. 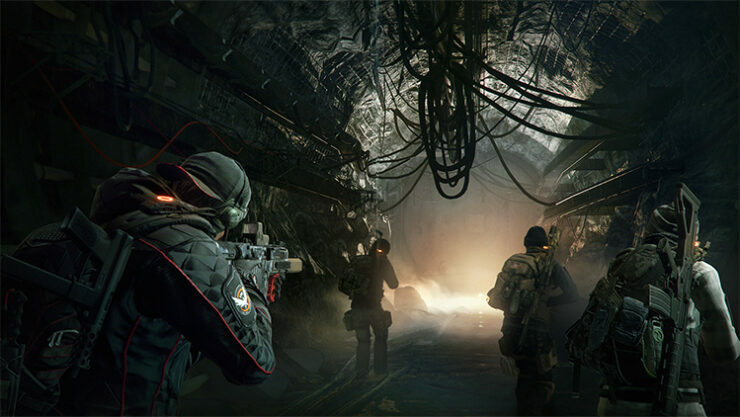 As with the free Incursions and Conflict updates, Underground brings a host of new features and loot, beginning with the expansion’s eponymous mode, which puts Agents into subways, tunnels, and sewers generated with random layouts. Additionally, Underground features a new Incursion called Dragon’s Nest, which will be bigger than those found in the previous updates. Set in Hell’s Kitchen, it features the Cleaners as a primary enemy as they continue their haphazard and dangerous attempts to burn the virus out of New York City. That’s not the only Division news coming out today: Challenge missions for Hudson Yard and Queen’s Tunnel are available now across all platforms, along with the Heroic difficulty setting for Falcon Lost, Clear Sky, and all missions that have a Challenge mode equivalent. Finally, to celebrate Ubisoft’s 30th anniversary, Division players will be able to redeem three full outfits representing Rainbow Six Siege, Ghost Recon Wildlands, and Splinter Cell on June 28 from Ubisoft Club. In DLC Expansion II: Survival, agents of The Division will have to survive as long as possible in a very hostile environment and in brutal weather conditions that will challenge even the most talented players. The second Division expansion is slated for a release later this summer.